The rhythm of the poetry produces ‘music’ that the reader creates as they read,” Treloar said. “The recipe design is a tool to help illustrate a plot, to encourage the reader to design their own story line. Sometimes one’s imagination can cook up some interesting concoctions. Self-taught folk musician and author Lucy Victoria Treloar has put a unique spin on the average nursery rhyme by incorporating silly poems, colorful pictures and “recipes” to help readers imagine their own realities in her new book, “A Musician’s Recipes: Strung Once.” Thanks to her musical experience, Treloar created a series of silly poems and rhymes that encourage young children to think outside of the box and create their own stories. After years of writing in libraries across the Mornington Peninsula in Australia, Treloar was inspired by library members and staff, and eventually found her place in writing where she could help educate, mold and inspire the generations of tomorrow. Lucy Victoria Treloar discovered a hidden passion for children’s literature buried beneath her love of music. Just as she taught herself to play the guitar, Treloar taught herself to write nursery rhymes that would enrich readers’ lives by humming a simple rhythm and tune. Motivated by conversations with children about the kinds of writing they find humorous, Treloar found that she was best able to express herself in a unique way of writing. 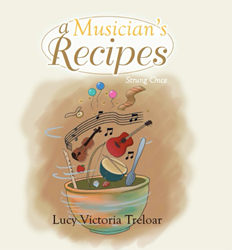 “A Musician’s Recipes: Strung Once” is Treloar’s first nursery book, but she has also written “A Musician’s Recipes: Strung Twice” and will be releasing additional “Musician’s Recipes” books in the coming year.